Do you have stubborn fat zones that defy diet and exercise? Or maybe you would simply like to contour your already attractive curves just a bit more. Dr. Dennis Dass brings an innovative option to patients who want personalized, non-surgical body-sculpting. 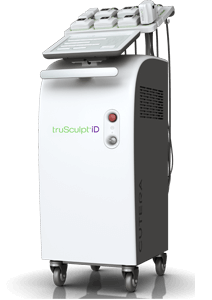 truSculpt® iD is changing figures in Beverly Hill, CA, one body at a time. The amount and location of obstinate fat on your body is largely a product of heredity. truSculpt iD gives you the power to overcome genetic predisposition. This system uses monopolar radiofrequency technology for effective body shaping. It accomplishes non-invasive fat removal by selectively targeting and therapeutically heating fat cells, without harm to surface skin. Painless treatment - Most patients compare the feeling to a hot stone massage. The temperature of skin increases, but remains comfortable, creating even, consistent results. Effective - Average fat reduction is 24 percent with just one 15 to 30 minute treatment. Quick fat loss - Change is noticeable within 12 weeks. No downtime - You may return to usual activities right after your appointment. Some patients experience flushing or warmth in the treatment area for up to an hour, or mild sensitivity for a few days. Versatile - While treatment on the abdomen and flanks is popular, it can be customized to many areas of the body. Impartial - Most people can be candidates for truSculpt iD treatment - men and women, including those with lax skin and varying fat thicknesses. Since treatment does not harm skin, it is safe for all skin tones and types as well as tattooed areas. You are in control - While the majority are quite pleased with results after just one truSculpt iD treatment, additional fat loss can be achieved with re-treatment. The choice is yours. Permanent results - Once targeted fat cells are gone, they don’t grow back. If you gain weight in the future, it will be more evenly dispersed. Dennis Dass, M.D. offers a full range of surgical enhancements as well as non- and minimally-invasive cosmetic procedures. Call (855) 496-4646 today to schedule your free truSculpt iD consultation.